This vendor goes out in the early afternoon with a cart offering various choices of meat, mainly hotdogs of various sizes, and meatballs. Hanging from the rack is dried squid, each squid attached with a metal clip (similar to a clothespin). To the right of the squid you can see long strings of meatballs, protected with thin white cheesecloth. 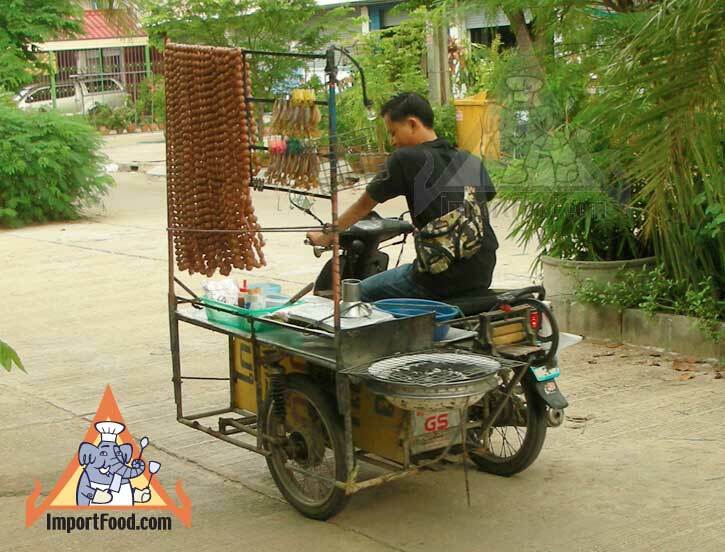 In Thailand some hawkers offer these meatballs, dangling from racks, on motorized vendor carts that zip along busy roads, without any protection from the dust and dirt of the roadway. 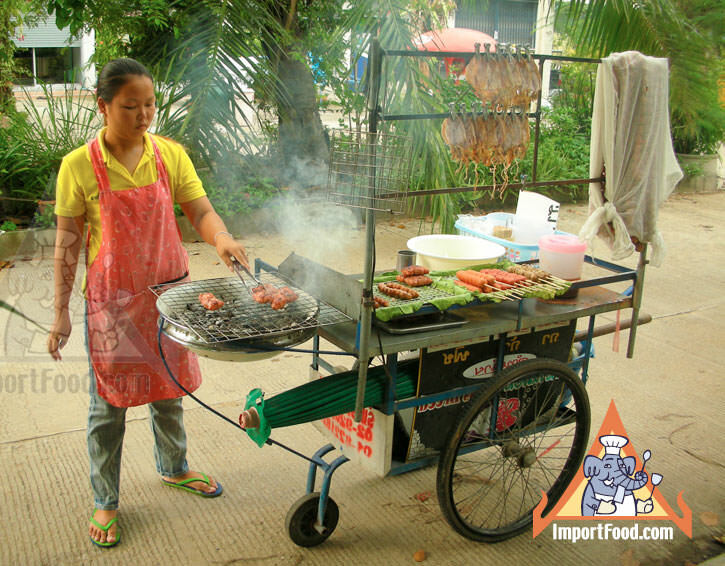 One specialty she offers is the traditional Thai sausage, called "sai grok". It can be seen cooking on the barbeque next to the meatballs. 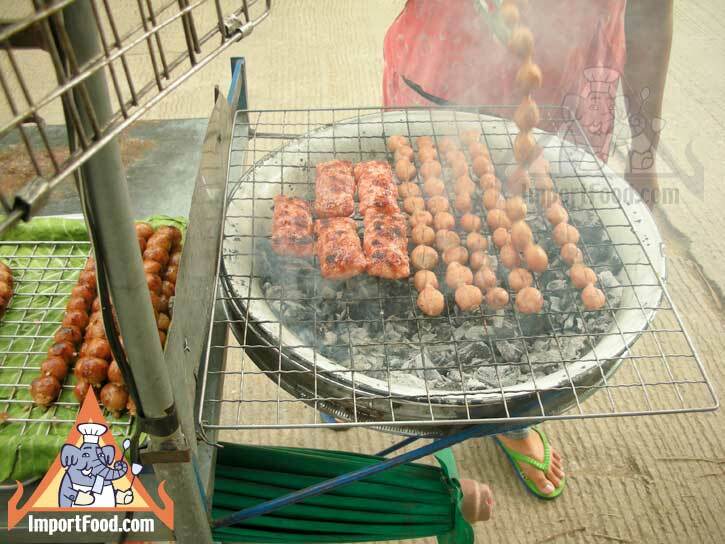 Nam is a traditional sausage from the northeastern (Isaan) part of Thailand. 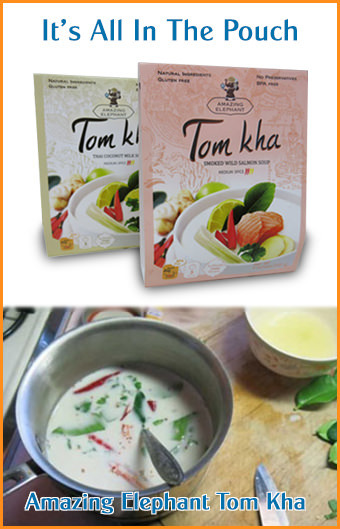 The main ingredient of this sausage is cooked jasmine rice, along with gentle spice and heat from Thai pepper powder. The sausage is known as something you can smell from far away, and it's considered a "full meal deal" rather than a snack, because you get meat, rice, and it's usually served with some pickled vegetables on the side. See our recipe for sai grok sausage.